Linoleum has been a popular flooring material for many decades. 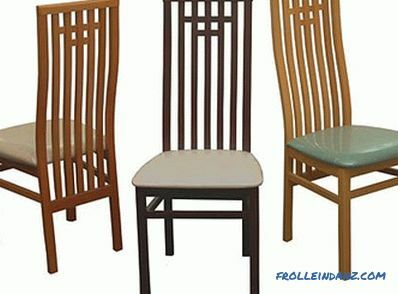 It is inexpensive, and presented a large assortment of colors and patterns. This material is easy to work with. All stages of repair can be performed independently, without the involvement of teams of repairmen. The only thing that can cause difficulties when laying is the joining of strips. The resulting seam can ruin the appearance, so the correctness of this work is very important. Let's figure out how to dock linoleum. Before you finally decide how to connect the joints of linoleum, familiarize yourself with various methods. Knowing about their features, you can make an independent choice. So, in total there are two ways of neat docking - it is cold and hot. The hot method requires the use of special equipment, experience and is used for commercial type linoleum (soft household will not work). With this method, the material is heated to 400 degrees . 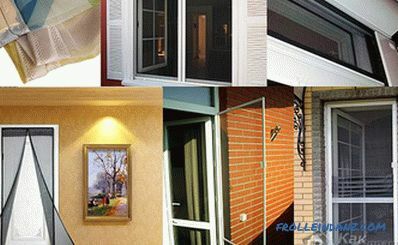 The result is a strong and durable joint that can withstand active use. 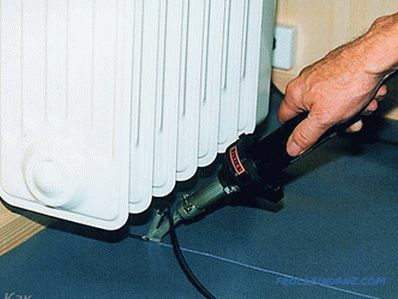 In everyday life, the cold connection method is most often used. It uses a special glue. In total there are two types - A and C.
It is necessary to clean the junction of various pollutants. This must be taken especially responsibly. 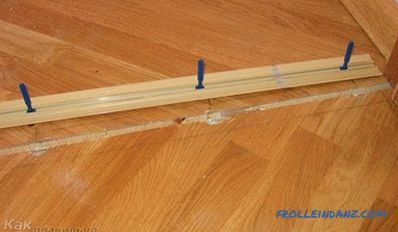 It is best to rinse the edges of the linoleum strips with water, but then let them dry. Then use masking tape. With it, sealed joint and the nearby part of linoleum. You can stick tape overlap. With the help of a knife, we cut the adhesive tape at the joint. Now take a tube with glue of type A. After opening it, fill with them the entire space of the cut in the scotch. At the same time, it is necessary to monitor the height of the resulting "side", its value should not exceed 4 mm. Now let the layer dry. 15-20 minutes will usually suffice. After the glue dries out, remove the tape. It is undesirable to disturb the gluing seam. We wait about an hour, without performing any work. During this time, the joint finally hardens. 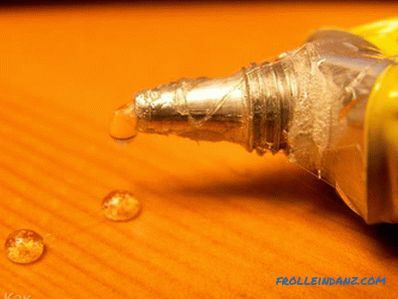 If the formed "rim" of glue is strongly protruding, it can be carefully cut off with the help of a joiner's knife. In the doorways, linoleum can be joined with a special aluminum sill. If you did everything slowly and carefully, then the connection will turn out smooth and durable. If Type A adhesive is suitable only to work with a new coating, type C can be used to repair old linoleum. The principle of operation is the same. The only difference is that there is no need to use masking tape. Type C adhesive is thicker and will not spread. And all the other steps are done the same way. Whatever tool you use to connect two pieces of linoleum to each other, it is important to remember about safety. Both types of glue can harm human health if ingested. Therefore, work should be carried out with an open window (it is better to have a draft in the room), in a mask and gloves. After work, the room should also be well ventilated. In modern Residential design often uses several flooring options. For example, in one room there may be ceramic tiles and linoleum. What to do in this case? To combine such coatings, you can use special aluminum powders. Today, this material is widely represented in stores. You can use the usual even threshold. In this case, it is mounted on the junction with ordinary screws. 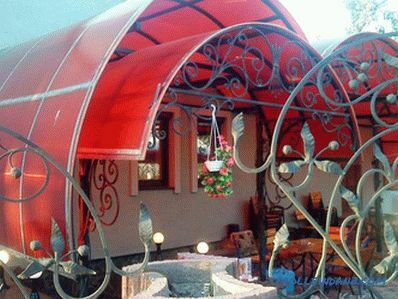 There are poroshek consisting of two slats. The first is attached directly to the floor. The second strap, decorative, is worn on the first, as a result, the caps from the screws are not visible on the surface, and the connection looks more aesthetic. If the thickness of the coatings is different, then you can slightly lift the edges. The floor is leveled with a cement screed or by placing a piece of plywood under the edge of linoleum. It is important to correctly calculate all the sizes so that a large gap does not turn out. After that, you can use all the same threshold or building glue. But you can do it easier - buy a powder nut that can connect coatings with different levels . 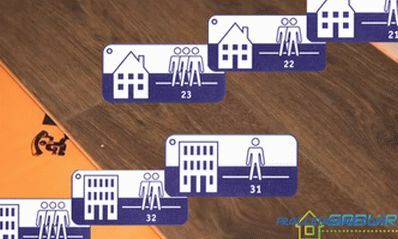 As a rule, such designs allow you to hide the difference in one and a half centimeters.Such powders are often used when joining laminate and linoleum. Pass-through. 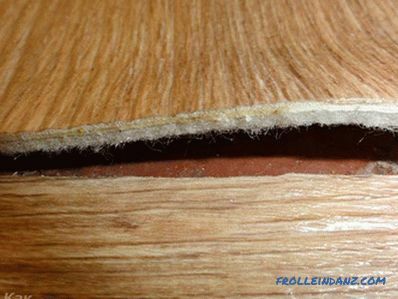 In this case, the nut is superimposed on the place of the joint (with approach to each type of flooring materials) and is attached with self-tapping screws. This method is convenient if the difference in height is negligible. With the use of a secret mounting bracket. This method allows you to make the place of the connection more beautiful, since the upper bar is smooth and has no holes. The mounting plate is attached to the floor on the screws, while it tightly presses the flooring. And already the top decorative strip is attached to it with the help of grooves. With glue. Such compounds are used quite rarely. 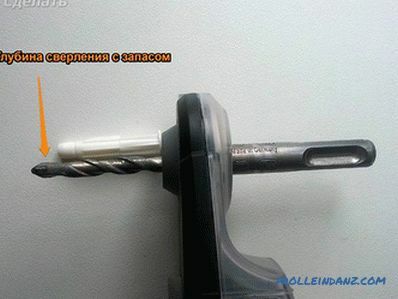 It does not allow to achieve sufficient strength, but to make it easier than the previous versions. At the place of joining the floor covering on the liquid nails mounted decorative strip. Then you need to wait for complete drying (it is better that all this time the bar was under load). 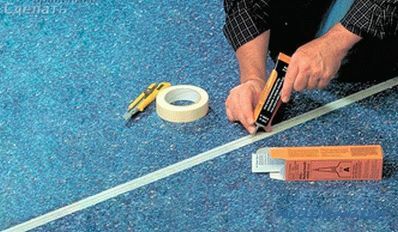 Instead of liquid nails, you can use any other construction adhesive, preferably silicone-based. 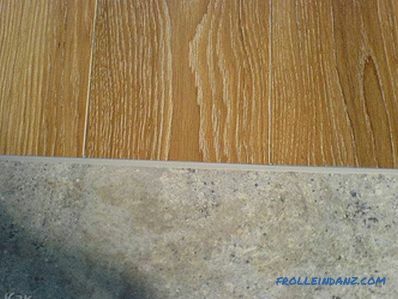 As you may have noticed, the methods of connecting linoleum with each other or with other floor coverings are sufficient. To fully understand the features of each method, we recommend watching the video. Commercial linoleum and similar materials can only be jointed with high quality welding.